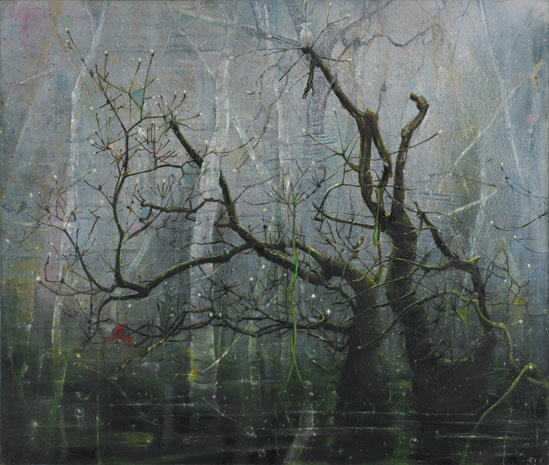 Look at the tree paintings of Elizabeth Magill. She combines an interesting range of techniques to evoke a slightly otherworldly sense of landscape. 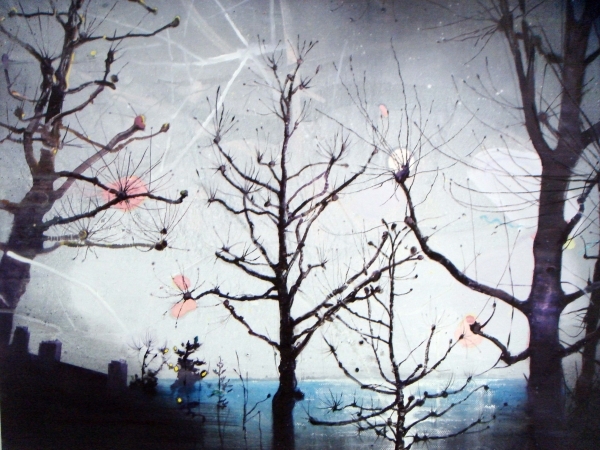 It is her use of transparent glazes beneath twisted tree forms that you might find interesting. 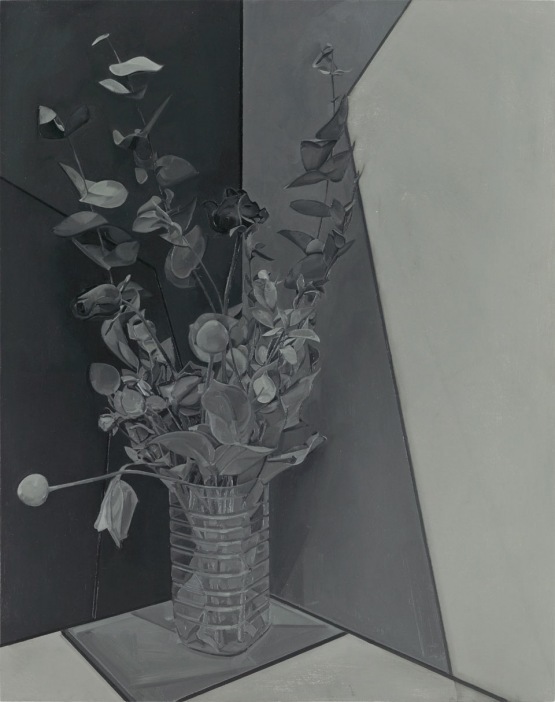 Gillian Carnegie paints beautiful, tonal still life paintings that have a contemporary edge. 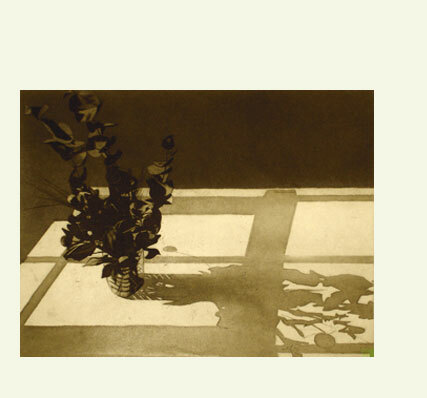 Look at her flower paintings and the way her limited palette emphasizes form and tone. If you haven’t already, it might be worth investing in the book ‘vitamin P, perspectives in painting’ as it’s an extremely good survey of contemporary artists working with paint. Elizabeth Magill (born 1959 in Ontario, Canadais an Irish painter). She studied at the Belfast College of Art and the Slade School of Fine Art, and now lives and works in London. I really enjoyed looking at Elizabeth Magill’s paintings but the three paintings here particularly stood out. 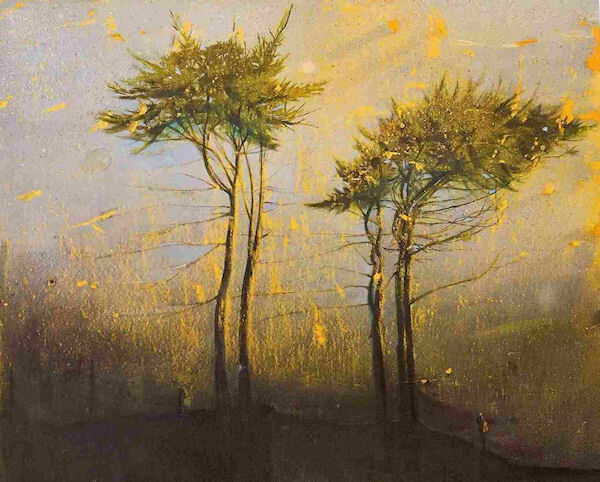 All these three paintings seem to use the same techniques which seems to be (especially in the last one) semi opaque layers of paint for the trees, or maybe even drips like in Islip, left. These last two paintings, Sighting and Islip, particularly caught my attention because of the backgrounds with the white streaks. How did she create this effect? Did she paint over masking fluid then take it off? Or did she use some other method to obstruct the paint? One thing for certain is I will try and create this effect if given the opportunity in part 4 of this course. I fell in love with Gillian Carnegie’s work at first glance, There wasn’t a painting that particularly stood out as I liked them all, her still lifes, nudes and landscape paintings. It wass hard though to fathom out the techniques that she used in her paintings. The leaves and petals in her still lifes with flowers looked like they have been created with one solid, smooth brush stroke, flicked up at the end while the vases had been painted with thin layers over the top. Is it possible that she painted the bunch of flowers first and then used glazes over the top to create the effect of sitting in a glass vase? Her nudes, or should I say partial nudes where she has chosen the most beautiful part of the body to paint (or at least to me), the small of the back, bottom and tops of the legs look both smooth and shiny, guessing that they were painted using both washes and impasto for the lightest parts of the body which is simple but very effective. This technique is very appealing but would I get the same results working on a smaller scale in my apartment, I suppose it depends on the upcoming exercises. 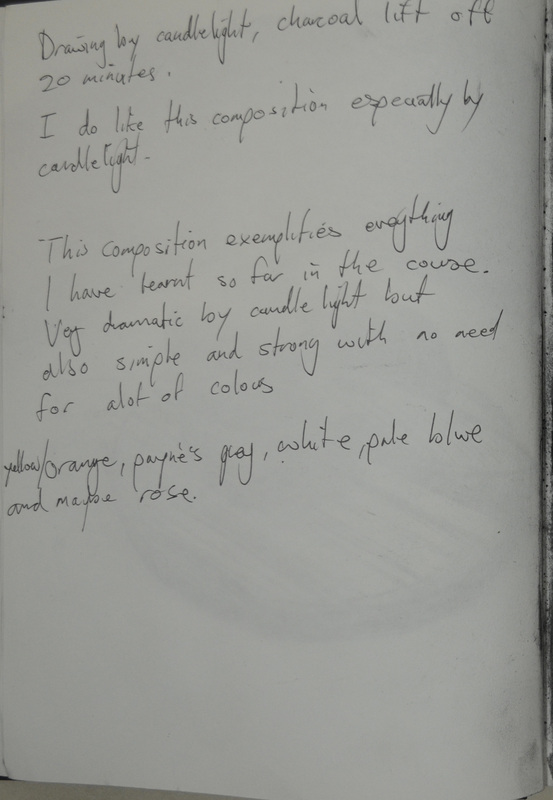 This entry was posted in Coursework, Tutor Recommendations and tagged Elizabeth Magill, Gillian Carnegie, tutor recommendations on November 9, 2015 by Mark A Smith. You have worked hard throughout this first assignment, demonstrating a confident understanding of the possibilities of paint. Your exercises as well as your final piece are competent and show a good understanding of the use of glazing and colour mixing. Your learning log is honest and reflective though you do need to increase the level of analysis, particularly in relation to other artists work. I will comment on some of your exercises and then your final piece. 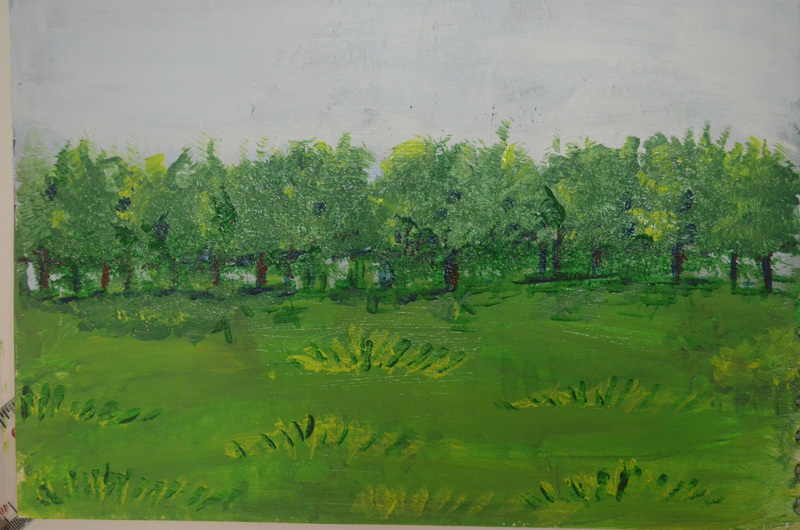 you are painting from memory and this type of mark making is more likely to happen when not observing detail directly. The pineapple is well executed. Here you achieve a surface texture which contrasts well with the bold, angular leaves. The confident shadow beneath the fruit works well as does the more subtle, grey shadow against the wall. Here you experiment with a good range of materials and techniques and produce a series of interesting and playful pieces. I particularly like the effects of using a toothbrush and painting knife. 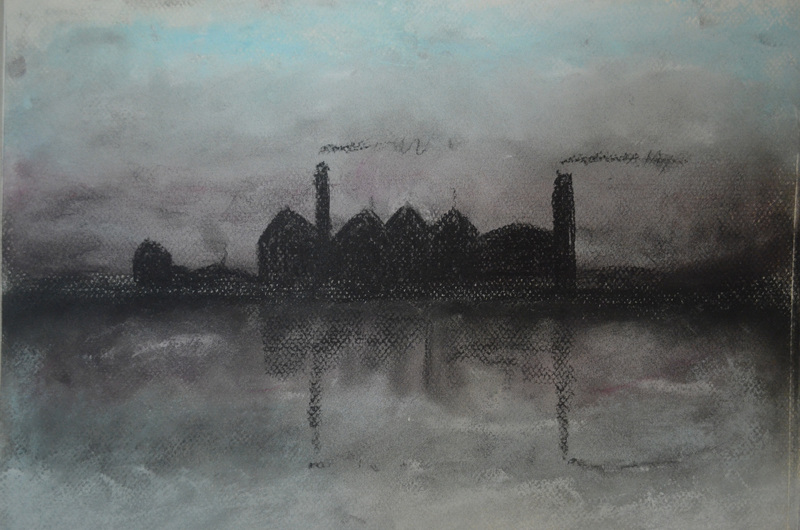 Pastels can be difficult to manipulate without overworking so I think you were right to keep it simple with your dark urban landscape, where you have created a sombre atmosphere and avoided detail. You have also managed to achieve sensitive results with oil pastel which is partly due to your decision to add solvent. This has softened edges and prevented the build up of pastel which can easily happen.You have managed to achieve a degree of luminosity where you describe the skin and have been careful not to over emphasise the facial features. You would probably have achieved better results if you had used an observational drawing from life or even a photograph you had taken yourself. This would have meant you had really looked and had some personal connection with it, whereas here the subject is rather stylised and unconvincing. Online images can of course be useful for research but a generic image of a winter tree is not going to inspire great paintings. However, I do realise this is a simple exercise about positive and negative space and you are right to note that these two techniques could be effective if both are combined in a painting. Unfortunately here there are no winter trees in Thailand as the trees are green all year round. It’s for exercises like this that I wish I was in England. All of your washes are well executed and demonstrate a confident ability to control the application of fluid layers of paint. Here you successfully depict a good range of tones from light to dark, avoiding harsh contrasts and keeping your subtle grey/green palette fresh and clean. This suggests you didn’t labour over this piece though you have included the right amount of detail to give the objects presence.The subtle reflections across the table work well, as does the texture of the apple. You are thoughtfully employing a range of techniques that you have experimented with in previous exercises. I don’t agree with your comment that the dilute yellow ochre ground was a mistake as this has added warmth and depth. The results may have been rather cold and less interesting if you had started with a grey wash. However, I would suggest you avoid mixing colour with titanium white as it is very opaque and overpowering. Add the more transparent zinc white instead as this allows colour to retain a degree of vibrancy, even when tinted quite significantly. All the art supplies here in Bangkok only supply Titanium white, this led me to believe that you could only get Titanium white in Acrylics. For now I shall try tone it down until I purchase some on the internet. Another successful study. Again, the light and shadow across the table are well rendered though the white highlights across the vase and bottle lid should have been softened slightly and made one or two tones darker. The composition is a more satisfying arrangement than the previous piece though I do prefer the paler study with the more sensitive handling of paint. It is good that you decided to try a slightly different approach for both pieces and the results are confident. 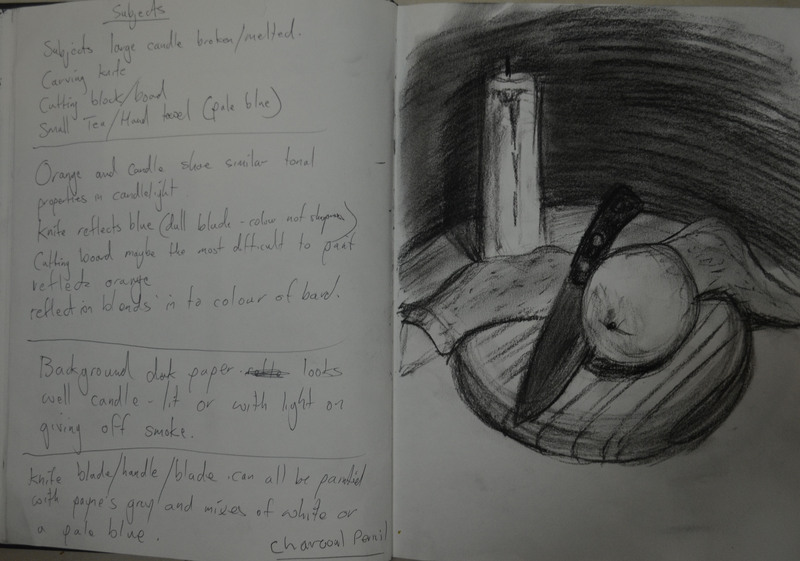 You have prepared well for this final piece, making charcoal and oil pastel sketches to help you arrive at a pleasing composition. The results are well balanced with a good combination of texture and mark making. There needs to be more shadow where the knife meets the chopping board, this looks a little flat but elsewhere, bold, unusual shapes of shadows add visual interest. I agree with your decision to add a glaze of burnt umber at the end. This adds depth and the blue background looked too obvious next to the orange. Complimentary colours clearly work well together but I think it is best to avoid relying on them in painting and instead use colour more imaginatively. Looking at the half way point image there are one or two qualities here that have got lost in the final piece. You were right to want to tone down the colour and I appreciate your interest in adding dramatic lighting but there is some overworking. 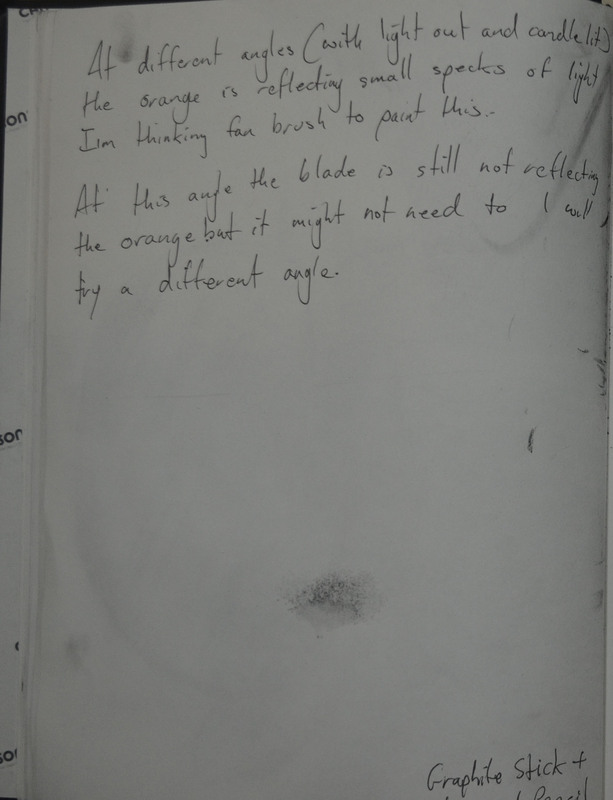 For instance, the cut orange behind the knife at it’s earlier stage does have a vibrancy and an economy of mark making that works well. The same applies to the candle. I added shadows to where the edge of the knife meets the chopping board and I am very happy with the result. It now actually looks real. Overall, you have completed a successful final piece that is the result of careful planning and a methodical approach – building up layers of colour and combining techniques you have explored in the previous exercises. You will be encouraged to experiment more as you continue working through the course and I would like to see more inventive compositions but this is a very good start. I have only seen a few pages from your sketchbook so don’t know how extensively you are using it. You seem to favour charcoal which you use with confidence but get into the habit of making quick sketches in watercolour, ink and acrylic. This will help build your confidence as well as your observational skills. And don’t be afraid to stray from the course material and sketch anything that inspires you. Sketchbooks are personal and a good place try things out and make mistakes. I have started to use my sketchbooks a lot more now. I kept a small sketchbook that I started a small project in . 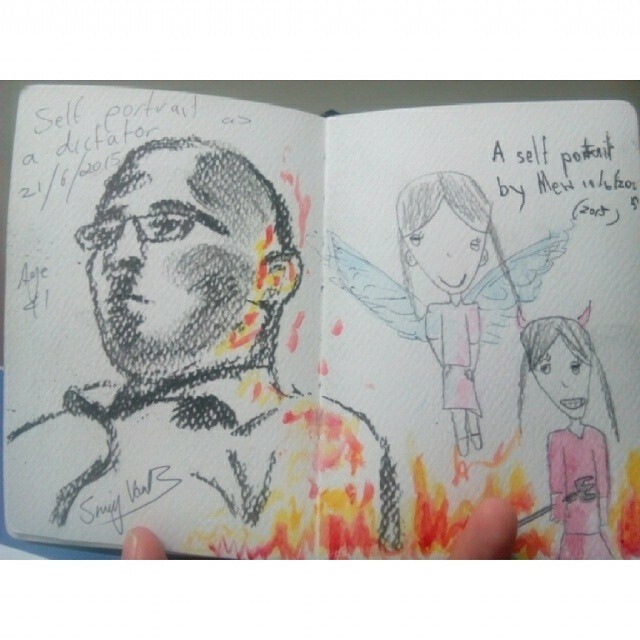 This sketchbook was kept for quick self portraits and to spur me on I got kids at school to draw their self portraits in it with a choice of mediums and I drew my own self portrait next to them in the same medium. Sometimes the result of this was a collaboration like the page below. Unfortunately I left it in a taxi with my tablet and the taxi driver refused to answer the phone so I never got it back. Time to start again. Luckily I did take photographs with my phone. You are reflecting on your own development with honesty and evaluating the outcome of the various project exercises and considering how best to improve. Your approach to making work is conscientious and thoughtful. You should aim to increase the level of analysis, particularly in relation to the work of other artists and you are adding too much biographical information. I don’t need to read about the life of Rothko but I am interested in how you respond to his work and what you can learn from looking at it. 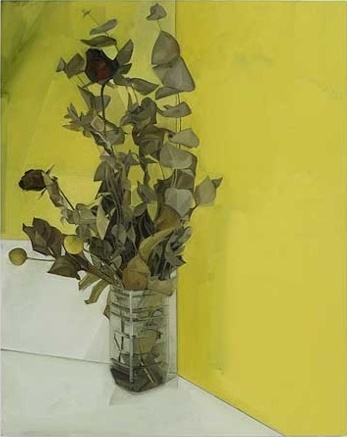 Also look at the work of Peter Doig and the still life paintings of Luc Tuymans, Morandi, Cezanne and Bonnard. Here you will have the opportunity to explore the possibilities of colour in more detail. You are already showing a good awareness of colour mixing and you will benefit from taking this further with this project. Try to resist the temptation to tighten up but allow yourself to be ambitious with the exercises, experimenting with a range of styles and processes. Also explore more unconventional compositions. As I’ve already mentioned, get into the habit of making quick colour studies in your sketchbook and avoid the use of titanium white. This entry was posted in Assignment 1, Coursework, Tutor Report for Assignment 1 and tagged assignment 1, distance learning art degree, oca painting 1, painting assignment, painting course online, tutor report for assignment 1 on July 28, 2015 by Mark A Smith. 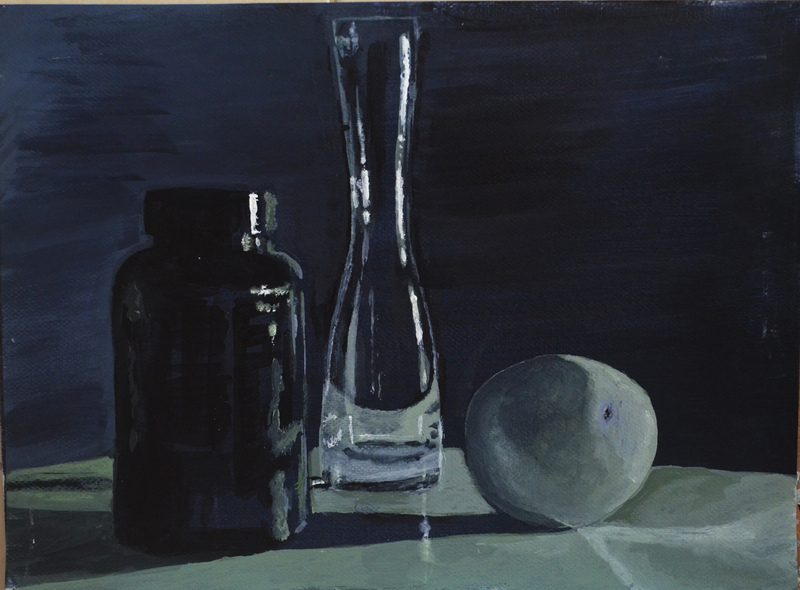 It wasn’t difficult to think of a subject to paint for this assignment, I really enjoyed painting on the dark ground for the last tonal study and I managed to pull the chiaroscuro effects off quite well, I really needed to see if I could do it again with different subjects. Maybe in the style of Caravaggio. 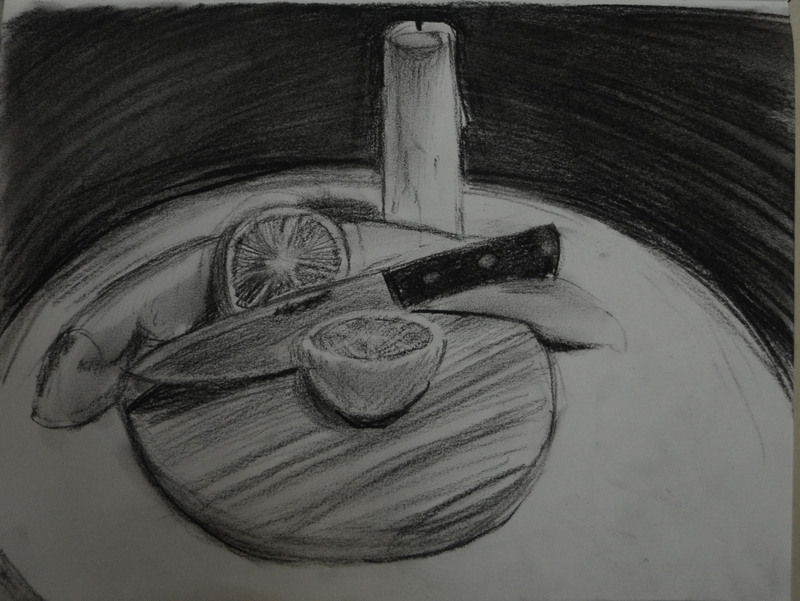 While working through the drawing 1 course, one or more students had drawn still life’s that included a chopping board and a knife, this gave me a great idea, I had used an orange in the last two tonal studies, Tonal study on a white ground and Tonal study on a dark ground so why not finish this part of the course with a still life of that orange been sliced in half on a cutting board. It would not just be the last in a series of paintings but it would be symbolic of the end of part 1. I also wanted to include the candle that I had used to light the second tonal study in my assignment piece so I was only lacking two subjects a large knife and a chopping board, I tried getting a natural chopping board, I usually see people selling them on the streets but when it came to buying 1 they were no where insight so a machined board and carving knife from Tesco had to do. Because i wanted to use as much as the dark ground as i possibly could I chose a black handled knife with three rivets. 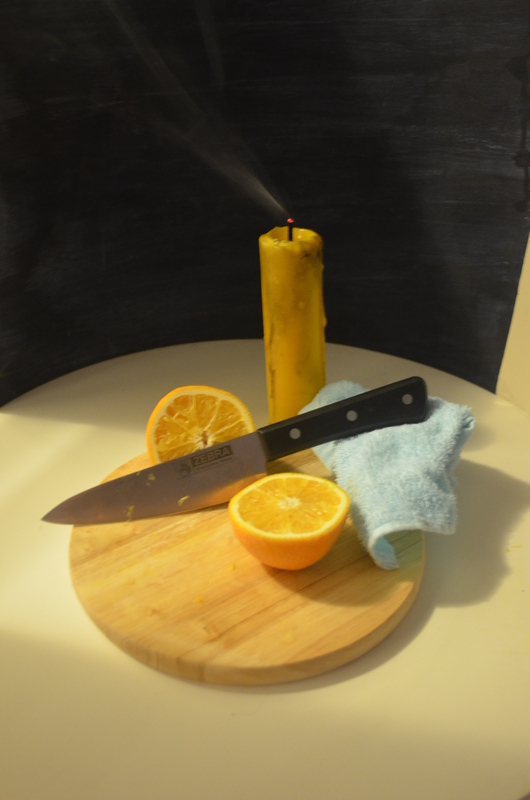 After cutting the candle in half to bring it lower to the other objects, it was apparent that I needed an extra object, a small towel, to prop up the knife. 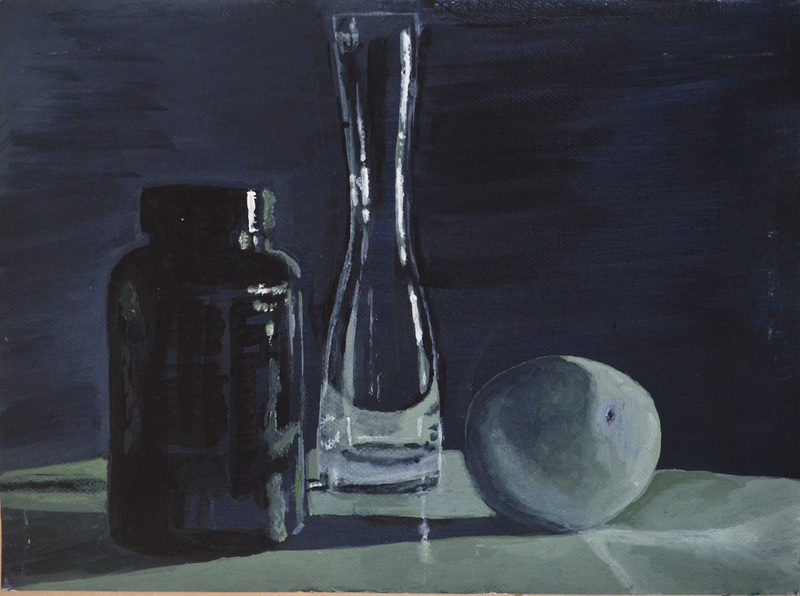 The first study I did was of all the objects together but with the orange in 1 piece, I did the first studies with the light on and candle unlit but took notes of how the composition looked in electric light and daylight. It was pretty hard to choose as both lighting looked good and the compositions looked great from all angles. 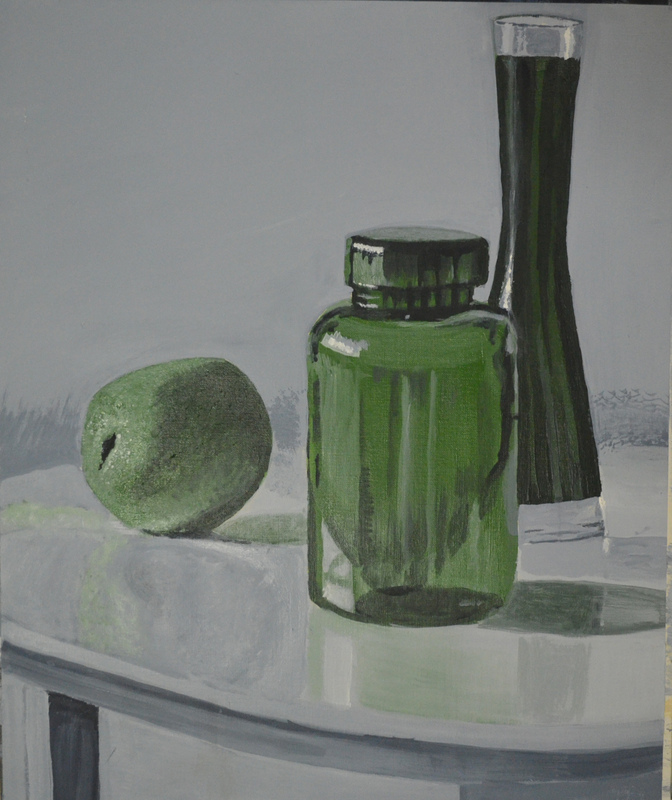 The tonal studies helped me to group the objects and specific parts of the objects into groups that shared the same colour properties and tonal properties e.g. 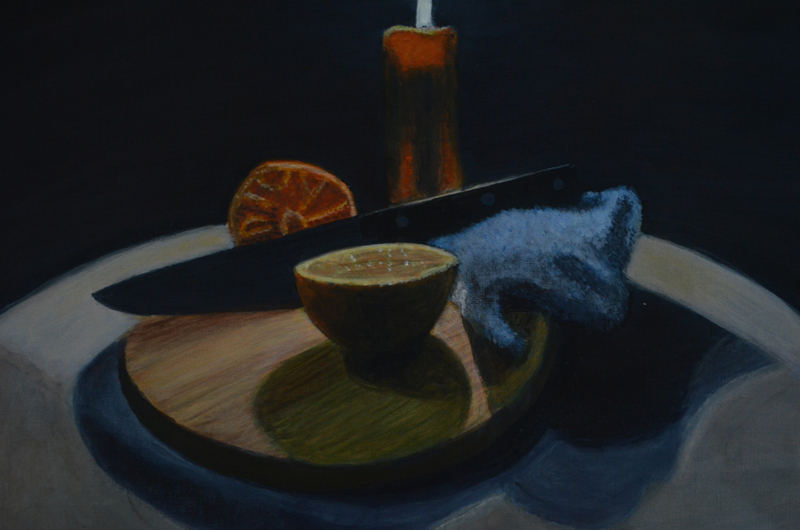 the orange, the cutting board and the candle shared similar tones and colour, the handle and the background and the towel, blade and rivets; in candlelight the groups changed. After the first study I decided to go ahead, be brave and cut the orange, the composition then went from a simple composition with 4 objects to a more technical composition with five. 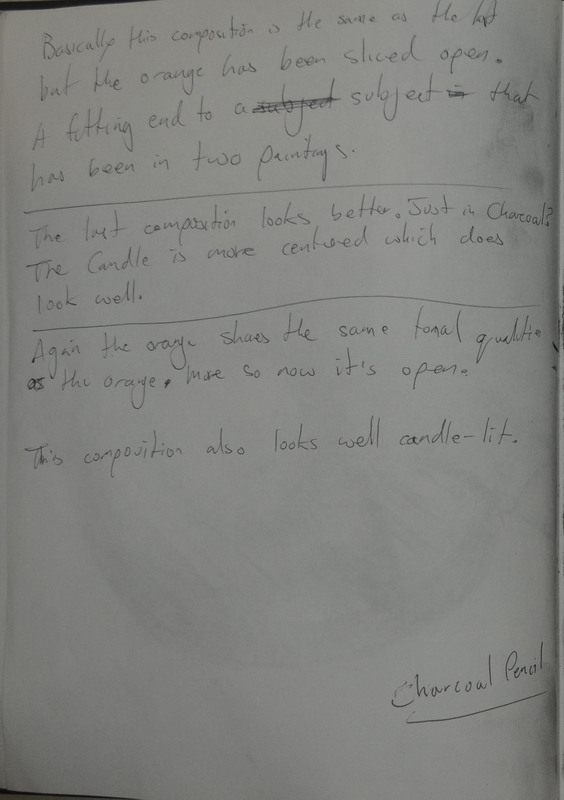 It also created more groups with the light off the candle and orange on its side sharing similar colour and tonal properties and the board and other half of the orange having similar properties. 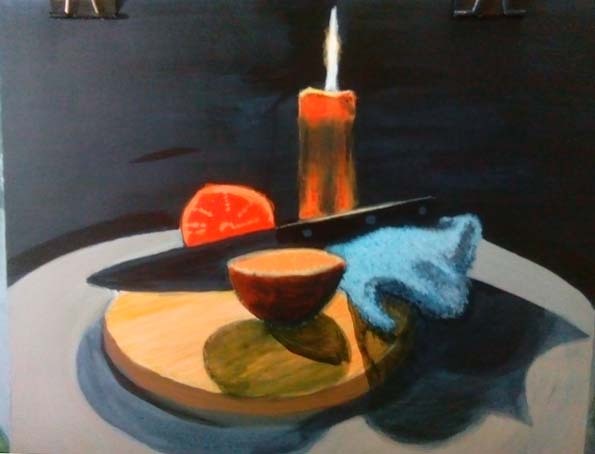 In the third study I decided to omit the towel but there wasn’t enough contrast in the composition for my liking plus i didn’t know if the knife would stay up for long. The blue towel was a nice contrast between the yellows, orange and beige and other natural tones of the cutting board. After making three studies with the light on I decided to try something different, as I would be painting this most likely with the light on to try and to further experimentation with chiaroscuro which was what I had initially intended to do I would make the next sketch in candlelight. This gave me an idea to make the next drawing using an entirely different technique. Lifting off the charcoal rather than drawing with it. 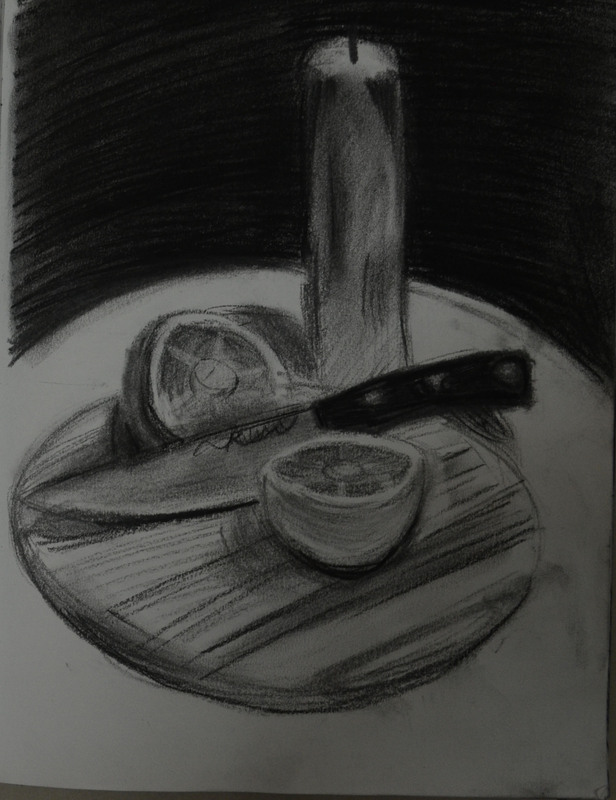 This time I drew from a different angle with my head closer to the level of the table, this added to a more dramatic effect and the knife rather than reflecting the orange and light like I had tried for in the first few sketches was completely dark with only a slight tonal difference between the handle and the blade; this meant that I could use more of the dark ground and could ‘model light’ defining the knife with a few simple details and highlights, this appealed to me. 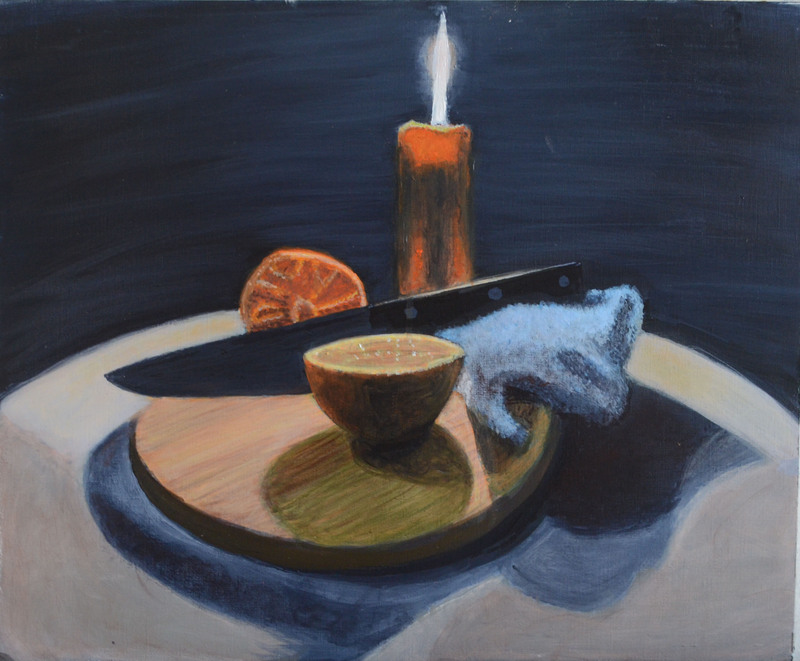 The shadow cast by the orange in front of the knife was also very appealing it meant that I could create a good sense of depth in the painting. I just wasn’t sure how well I would be able to paint the candle, flame and the light the glow around it. 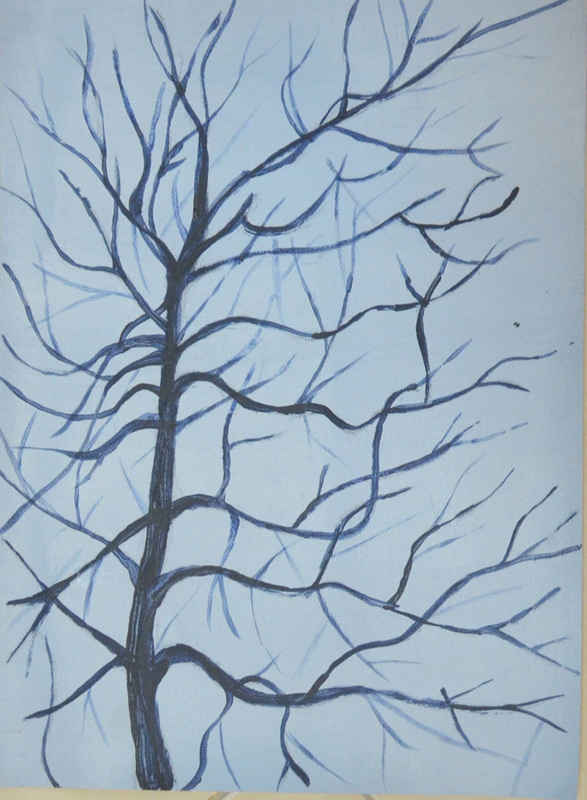 After preparing the acrylic paper with a dark ground (Payne’s grey I drew in the shapes with a white conte stick using my paint brush to help as a measuring tool. The shapes weren’t precise but that wasn’t too important at this stage just as long as I had something to work from. As it turned out the shapes were well out and did need a lot of editing while I was painting. 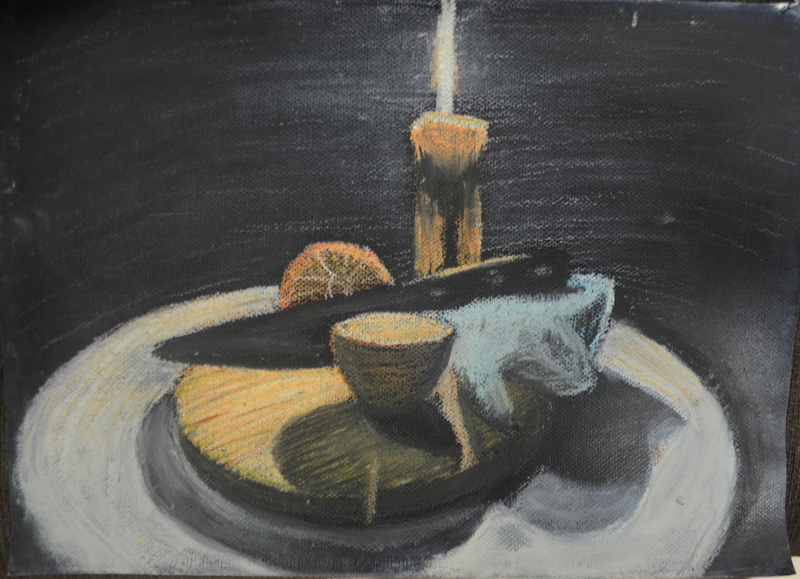 From there I painted the highlights on the top of the knife so that I knew it was at the correct angle and painted in the candle and both halves of the orange in cadmium orange (highlights in yellow), I could have done this differently. The best way would have been to model light by building the colour gradually on top of the dark ground rather than blocking in the shapes then painting the shadows over the colour like I did. From there I painted the chopping block with the same cadmium orange but used a lot more white and the darker parts in yellow ochre. The towel was painted in different mixes of light blue, Payne’s grey and white using a stippling effect with a small flat brush to create texture. Shadows on the board and orange were painted in a mix of Payne’s grey and chromium green in thin glazes. 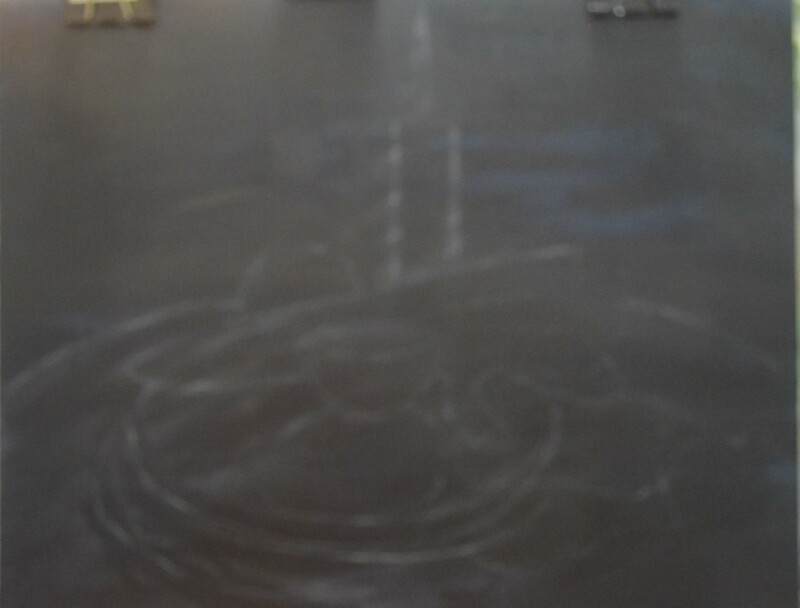 while the shadows on the table were painted in thin glazes of white and payne’s grey over the top of the dark ground. It got interesting round about the half way point with objects painted but still very rough and very bright I had to think about the techniques and colours that I would use to tone down the painting as well as give the painting a dramatic feel as seen in Caravaggio’s paintings. It was here that I stopped looking at the still life composition and any photos I had taken just glimpsing from time to time, as painting as I saw it had negative effects, when I came to take a photo the colours were to bright or didn’t look right so I started to paint how I felt it should look. Burnt umber, Payne’s grey, pearl orange, yellow ochre and white became the key players. Very thin washes of Payne’s grey helped me to tone down the orange of the candle and upright orange slice while yellow and white followed by a very thin glaze of the grey were used to make the orange pointing upwards look more like an orange. I used a scrumbling technique with very thin seperate layers of white, pearl orange and burnt umber to make the blue of the towel more subtle. The board was probably the most challenging it was just too bright and I knew that it was the board that would make the painting if the board looked bad the rest of the picture would too. The brief said not to get wrapped up in any one object and too look at the painting as a whole but the board was a major part of the painting and so it needed to be right. I added thin layers of burnt umber over the orange mix and then used thicker layers to paint in the grain. I painted over the shadow with a layer close to the original orange/white mix, then a layer of green followed by washes of burnt umber and Payne’s grey. This was a vast improvement. While sat here writing this entry and thinking that the painting is finished I have started looking at the photos I have been posting to this log again and realising something is not quite right. I have stayed as close to the original tone of the background as possible. 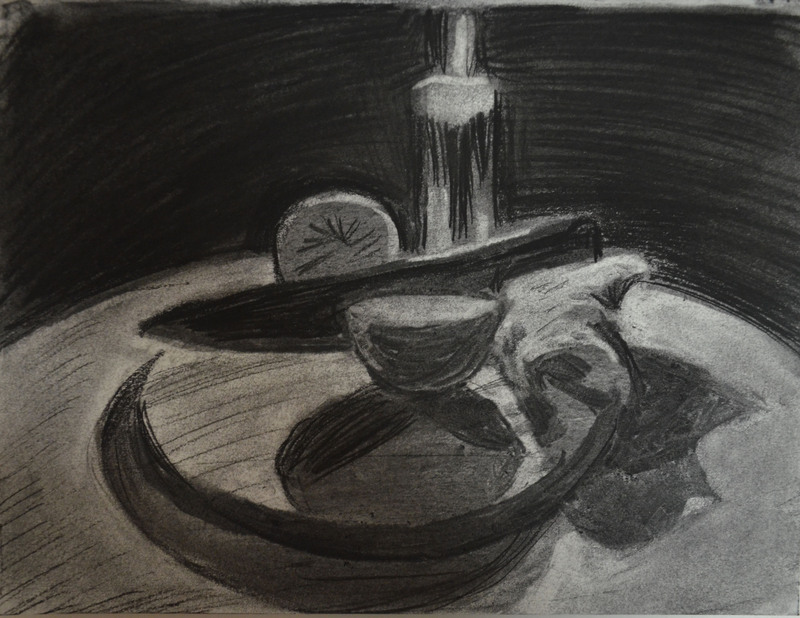 The dark painted paper that I used for a background reflected light from the candle and that’s what I have tried to show here and I think that’s where I’ve gone wrong. Rather than depicting any background at all I should be depicting an absence of one to allow the viewer to make up their own mind to where the painting is set, whether it’s in a small room, large room or even a cave. Caravaggio seems to use a brown tint in his background which allows the viewer to do this and so I have painted over the Payne’s grey background with a glaze of burnt umber and payne’s grey leaving the original colour around the candle to hopefully make it look like it is emitting light. Feedback from my tutor will hopefully let me know if I have been successful or not. I managed to use most of the techniques I have learnt from starting the course plus a bunch of techniques from the drawing 1 course. I didn’t rely on my eyes as I have done with most other exercises and assignments instead I went with how I felt it should look. Maybe this is the start of me developing a personal voice. I particularly liked the way an oil pastel study gave me a good insight into which colours I would be using for acrylics. I didn’t question this and I’m glad because it worked. Using washes and glazes in the painting was very interesting, years ago i would have repainted the subject if it was too bright, understanding how to use glazes has given me a push in the right direction. 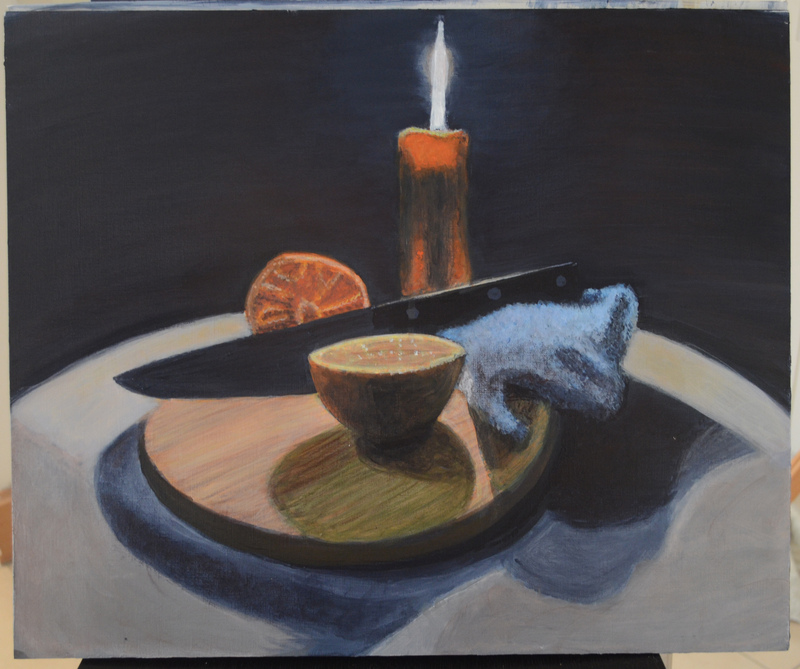 I am very happy with the overall painting especially at this stage, it does have which I hoped it would a dramatic feel to it, even if it’s just a knife cutting an orange. 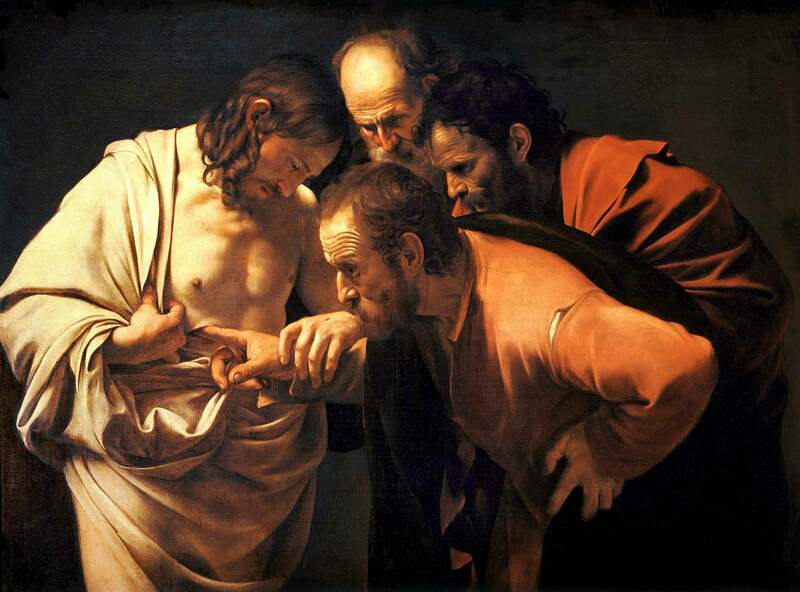 I feel that the painting does show influences of the artists I researched for the Chiaroscuro particularly Caravaggio. 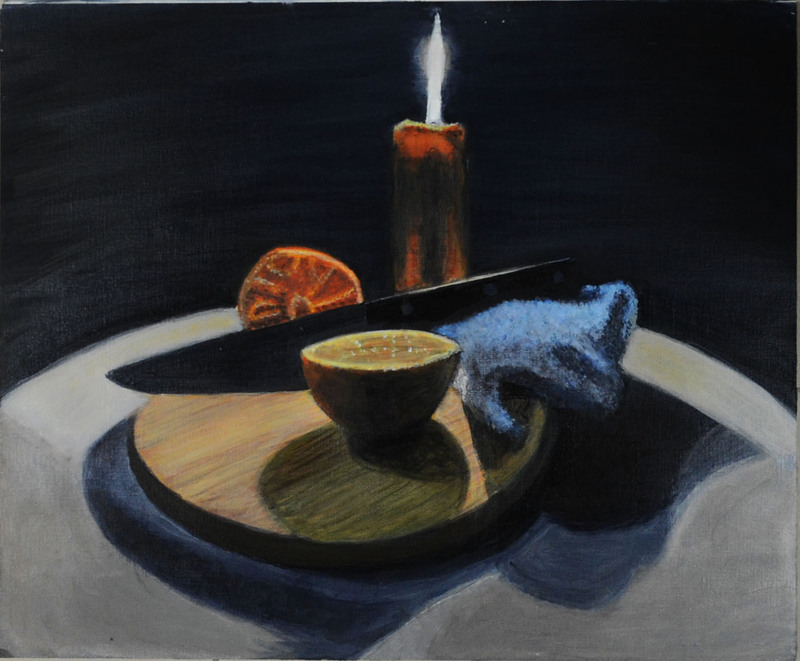 There are parts of the painting that I do feel exemplify the chiaroscuro technique really well particularly the knife handle resting on the blue towel. This is probably the best part of the picture. The shadows particularly from the orange help to create a nice depth to the painting. The texture of the hand towel could not be improved on to me this is perfect. The brown tinted background – This really finishes the painting nicely. I may have been able to improve on the glow around the flame but I didn’t want it to strong but for now the tint of burnt umber helps to create a halo around the grey. For the life in me I couldn’t get the wax under the flame of the candle like it did. I couldn’t get the wax under the flame to glow like it did this would have probably really improved the look of the painting. The colours are a bit dull but any brighter didn’t look right at all so they had to be toned down. The knife blade is out of shape but I couldn’t keep messing around with it for the objects around it. Not sure if the blade looks twisted or not from the handle. Too me the candle looks flat. I’m not sure what technique I should use to improve on this. Not sure if the shadows of the board should be darker. I had a problem with the mix of greys and adding colour tints to them. 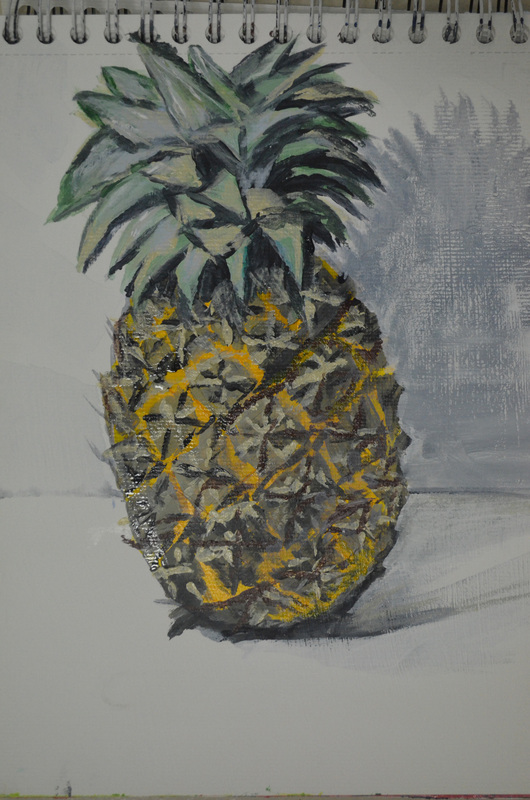 This entry was posted in Assignment 1, Coursework, Pt 1 - Introduction to Painting and tagged assignment 1, bachelor of arts, basic paint application, chiaroscuro, distance learning painting course, oca painting 1, open college of the arts, painting 1, painting BA, painting course on February 11, 2015 by Mark A Smith.